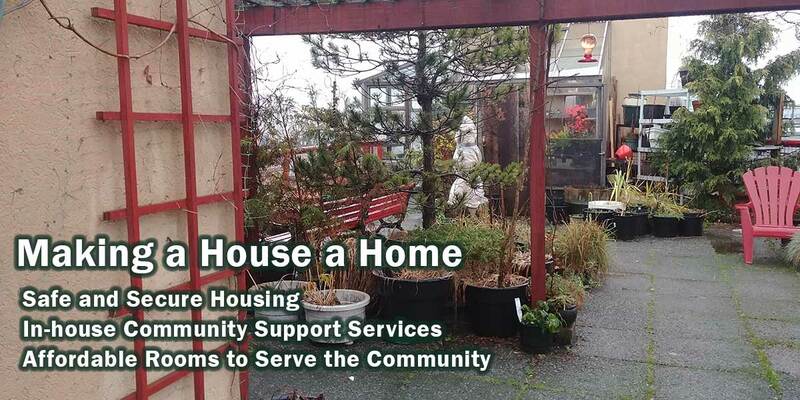 A survey done by Veterans Affairs in 1984 revealed that over 900 Veterans lived in the Vancouver Downtown Eastside. Many lived in deplorable conditions because their lifestyle classified them as “hard to house”, and the upcoming “Expo ‘86” threatened to render many of them completely homeless. Various Veterans’ organizations came together in a non-profit society to deal with the problem. For the first time, The Royal Canadian Legion, The Army, Navy and Air Force Veterans in Canada, the War Amps, and the Korean Veterans’ Association, as one consolidated group, worked together with Veterans Affairs Canada to find a solution. Thus began the Veterans Memorial Housing Society (VMHS). Canada Mortgage and Housing Corporation was approached and approved mortgage funding for a 134-room facility. 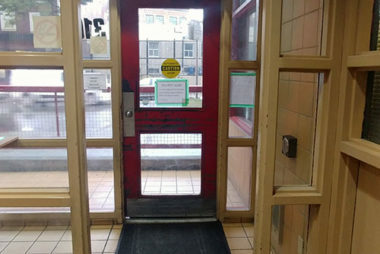 Evelyn Saller, Directoress of Club 44 on Cordova Street, agreed to move that facility into the new project, so a comprehensive list of services could be available on the onsite. The City of Vancouver purchased the property and leased it to the Society on a pre-paid basis. 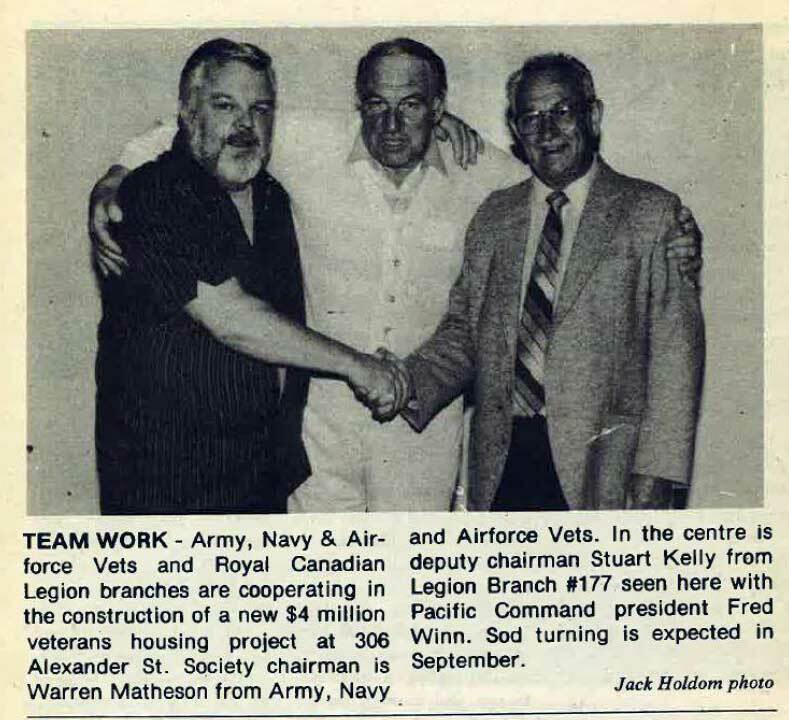 Construction of a five story, 134-unit facility with space for Club 44 was begun in 1985 and the Veterans Memorial Manor was completed in August of 1986. In addition to support for construction, many Legion Branches, A.N.A.F. Units, the K.V.A. and private individuals came forward to donate funds to furnish the rooms. The War Amputations funded the handicapped rooms as well as an Intercom system. Shalom Legion Branch #178 provided a bus that the Port Moody Legion Branch #119 maintained. It filled quickly and became “Home” to a great number of Veterans over the past three decades. Many previously “hard to house” veterans settled in, and lived in the Manor right up until their death. The Manor provides various types of housing, from basic sleeping rooms to bachelor suites with full facilities. The structure reflects well the diverse needs of the population. For a time, there were also rooms dedicated to Palliative Care. The VMHS recognizes the original support of so many who constituted to make the project a success. 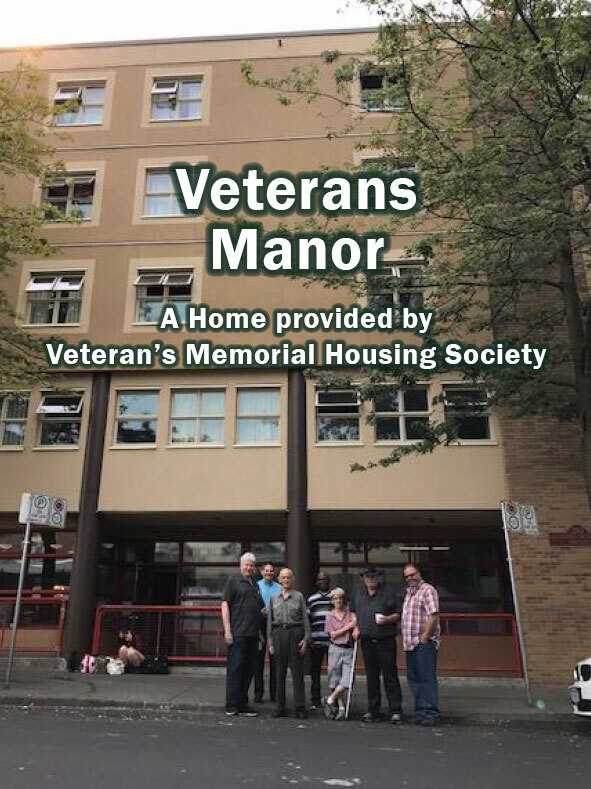 This list includes C.M.H.C., the City of Vancouver and the Evelyn Saller Centre, the Provincial Long Term Care Program, their Nurses and Doctors, our Staff, and of course, the various Veterans’ organizations without whom the project would not exist. As the Veterans’ population decreases, it is the objective of the VMHS to find a new role for the facility in addressing an unmet or pressing need in the Downtown Eastside community. 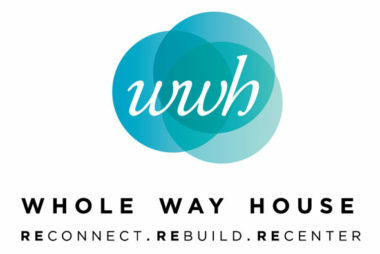 The Manor is providing housing to single men, 55+ who are at risk of homelessness and usually have mental health or addiction issues. The Manor has shown that the needs of the “hard to house” can be met in a compassionate as well as economical manner. We are convinced that this approach can be used to address other needs in the community and look forward to doing so in the years to come.